What does an academically deep education infused with justice and care look like? What does it mean for each and every child who enters our door and then graduates years later to middle school? As the Head of School at Giddens and as a parent of a student here, these are questions I frequently consider. I recently revisited writings by Dr. James Banks, the founder and director of the nationally recognized Center for Multicultural Education at the University of Washington. He remarks that education should enable students to acquire the attitudes, knowledge, and values needed to know, to care, and to act to make the nation and the world more democratic and just. At Giddens, our faculty make this ambitious vision of education come to life each day in every classroom. We do this by knowing each and every student. We engage students in academic opportunities that support them to reach toward their potential and to develop a deep understanding of each subject matter. We integrate those opportunities with questions of justice while attending to each individual student’s social and emotional needs and strengths. Our students learn to think like scientists, like mathematicians, like writers, and like artists. Our students learn to ask questions about fairness, about access to opportunities, and about equity. Our students learn to know themselves, to understand their own perspectives, and to respect the perspectives of others. Our students engage in knowing, they engage in action, and they engage in caring. Our entire school—faculty, students, administrators, trustees, parents and alumnae—are engaged in work that ensures Giddens is a diverse community, committed to this vision. We recognize diversity, in all of its forms, is essential to supporting our students to thrive individually and as part of a broader community. With experiences that bridge across lines of difference, our students leave Giddens with the knowledge and skills to embrace the world we know and reach toward the world we hope for. I look forward to your visit and the opportunity to show you Giddens’ teaching and learning in action. You will see engaged and passionate students who love being at school. You will see students who exercise critical thinking and who are becoming individuals within a community of learners who know, who do, and who care. I hope you will come learn about a Giddens’ education and that you will decide to join our community. Morva earned a Ph.D. in Administration and Educational Policy and a M.A. in Curriculum and Instruction at Stanford University after serving as an elementary school teacher in San Francisco. Previous to her work at Giddens School, she served as a Professor of Education at University of Washington. Her work at UW focused the integration on social justice and teaching. 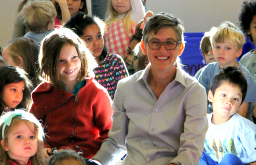 She began her tenure as Head of School on July 1, 2015. In our multiage classrooms, opportunities for students to learn in small groups is based on specific assessments of their learning and not simply based on age or grade. Read more about Why multiage classrooms? Every year as part of professional development activities and as spring emerges, I meet with staff to assess their plans and career goals for the upcoming academic year.